As I sat down to write an article for the Panorama on firearms and museums, I found it difficult to pick one area of focus because not only is the study vastly complicated but also there have been very few discussions on the subject. Firearms as objects create many interpretive opportunities, but one must be mindful of other concerns. For example, when a firearm is admitted to a collection, an employee must understand safe handling procedures. This person should treat incoming firearms as if they are loaded. And trust me, this has been known to happen! In addition to safe handling, a managing employee of a United States museum must also know and understand gun laws at federal, state, and local levels because unless that institution is a government entity, they are bound by those laws. There are other display debates about removing firing pins, which renders guns inoperable, and questions about appropriate levels of security in exhibits, depending on where the institution is located. There are few resources that tackle some types of firearms in terms of care, conservation, and handling. In addition to my work as Curator of the Cody Firearms Museum, I am also a consultant to many museums around the country and conduct workshops on these matters. However, in addition to these practical considerations, there are emotional, political, and cultural implications with firearms collections. To put it simply, these artifacts have a lot of baggage, some warranted, some not. Despite contemporary debates about guns, there is little scholarship on them in terms of material culture, and even fewer people who are trained in both museums and firearms to educate the public. Museum professionals need to be able to gauge visitor expectation and experiences to curate exhibits that can adequately convey the messages they want to share. About five years ago, I began lecturing on the concept of artifacts either associated or perceived to be associated with cultural trauma and how we can best interpret them in a presentation I now call “Displaying the Politically Incorrect.” This expression was inspired by a Yahoo Travel article in 2014 that listed ten politically incorrect museums. One of those was the National Firearms Museum, part of the National Rifle Association’s Museums Division. That research into whether artifacts can be politically incorrect led me to a survey on how guns have been displayed in museums in the past and how they are displayed now. The survey asked questions such as these: Are the displays having the desired effects on an institution’s visitation? Can more be done to interpret these artifacts? And can a museum, which is meant not to venture into the political realm, find a way to contextualize complicated narratives for visitors to encourage productive and informed conversations outside the museum walls and even into the gun debate? Much of this research and these questions have been applied not only to helping other institutions, but also to a project on which I serve as Director, the Cody Firearms Museum (CFM) renovation. The CFM is undergoing a $12 million renovation. The museum has an encyclopedic collection that is viewed by a large audience who identify as enthusiasts and/or collectors. However, because it is on property with four other museums unrelated to guns, it is also the only firearms museum in the country that reaches a non-gun audience. So, we have had the difficult task of balancing the display of the collection for the enthusiast, or in-the-know visitor, as well as contextualizing it for those who seek more information but have little interest in the changes of proof markings. We also must interpret 800 years of history, with 6,000+ objects, in 40,000 square feet . . . no easy task! We are trying to tell a range of thematically driven narratives, bringing out storylines from all peoples, including Native Americans, African Americans, women, and the LGBTQIA+ communities. Will it be a deep dive into any one particular subject? No, but it will push firearms museums into a new realm of being not only a cabinet of curiosity for collectors but also a place for dialogue about histories that hurt and histories that do not. Instead of one thread, I decided to give you a broad glance at the ways that guns have been interpreted and used in museums. This article is a snapshot of my larger research project on the perception of guns in culture and how those perceptions affect museum interpretation, culminating in the renovation of the leading firearms museum in the country. In 2016, the Aspen Institute and Wesleyan University hosted a symposium on firearms and common law. While most of the conference was dedicated to scholarship on both the United States and the English Bill of Rights, at the conclusion of the multi-day forum was a roundtable on firearms as material culture in museums. Surprisingly, it was one of the first times that these museum professionals trained in the study of firearms had been gathered together for the sole purpose of discussing opportunities and limitations of having guns in museums in the twenty-first century. After the symposium concluded, organizer and Wesleyan Professor Jennifer Tucker continued the conversation through a written roundtable that is set to be published in the journal Technology & Culture. Less than a year later, the Cody Firearms Museum at the Buffalo Bill Center of the West created a full-scale symposium dedicated to the academic study and public education of firearms history. This symposium, Arsenals of History: Firearms and Museums in the 21stCentury, had a diversified group of participants including but not limited to representatives from the Metropolitan Museum of Art, Art Institute of Chicago, Smithsonian Institution’s National Firearms Collection, Colonial Williamsburg, US Marshals Museum, NRA Museums, Mob Museum, Marine Corps Museum, Autry Museum of the West, and the Royal Armouries (Leeds). The forum was a combination of public lectures and private workshops that covered a wide array of topics, including proper care and conservation, legal liabilities, and the role of public firearms collections, if any, in the modern gun debate. The inaugural symposium now has become an annual series that has led to the formation of an association for the academic study of firearms both in universities and museums. The largest take-away from the first symposium was that in every institution, from the Met to the Autry, firearms exhibits tend to be some of the most publicly popular, but are both academically and internally the least respected. But how did a dichotomy form where firearms are prominent in our history and museums, but the pathway to study them is limited and the training for museum staff almost nonexistent? Gun Cabinet, Waffenkamer, Schloss Erbach. Courtesy of the Art Institute of Chicago. It is no surprise that firearms are highly politicized objects in current culture. As a result, it can become difficult to separate these artifacts from their actual versus perceived historical narratives. Firearms have over 800 years of history, and while there are narratives of violence attributed to them through an array of different circumstances, both military and civilian, there are many firearms that were not made for such purposes, including art and exhibition pieces as well as sporting arms. With contemporary conversations about firearms on all sides of the political spectrum, it can be difficult for both visitor and employee to dissociate historical artifacts from these discussions, creating a curator dilemma of how best to engage with the public on various and potentially separate historical narratives. As cultural shifts in attitudes toward guns and general conversations on museology change, it may seem quite odd that current firearms displays have not shifted as well. In fact, these displays have not strayed far from their original methodology. 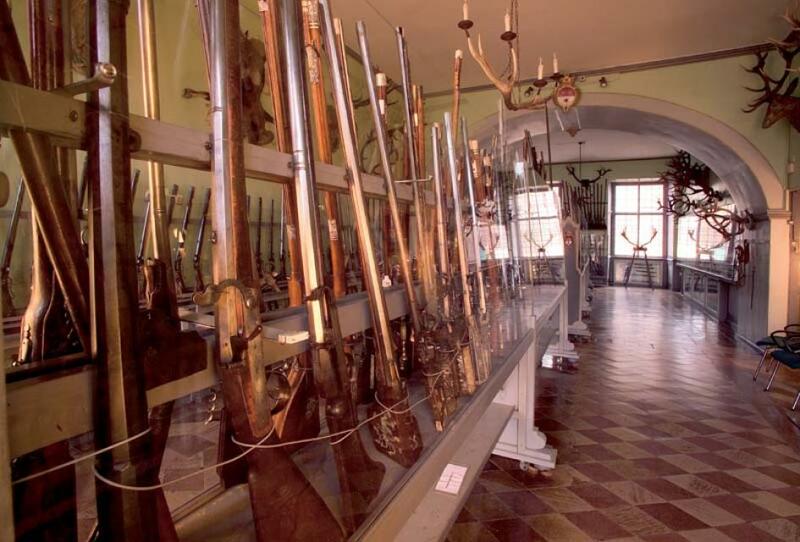 Centuries ago in Europe, firearms were showcased in racks of open storage that were called gun cabinets. These exhibits consisted of embellished sporting arms, with some military pieces, that nobility used to show off to their guests. And in most instances, these pieces, while functional, were considered art. While gun cabinetry existed in the private sector, that style of display, akin to cabinets of curiosity, persisted in public museums. And firearms forpublic display and consumption date back hundreds of years. The first intentional public exhibition of firearms in England dates to 1688 in London. In Liege, Belgium, the Musee d’Armes opened in 1885 and in the United States, the U.S. Patent Office Building showcased the country’s first firearms display in Washington, DC in 1840. The Smithsonian Institution followed with its firearms collection, first displayed in 1876. Even premier art museum, the Metropolitan Museum of Art, founded its Arms and Armor Department in 1912. The main thread among all these institutions, from armory to art museum is that, at some point in the institution’s history, firearms were displayed in similar fashions. In United States museums, firearms typically appear in one of four methods of display—Contextual, Gun-quarium, Visible Storage, and Segregation—or a combination of several. It is safe to say that at least one firearm or firearm-related artifact appears in most museums around the country. Oftentimes, if a museum is focused on a specific theme or framework, firearms are integrated into the display. They are displayed alongside other artifacts to convey a story about the time, place, and people of an event. The artifacts therefore are used to further these ideas. These collections feature firearms as part of a larger history. Most often, firearms appear in military galleries, partly because the military connection is the most prevalent, as firearm advancement was driven initially by conflict. Additionally, many military museums are sites of arsenals, armories, or military training such as the West Point Museum, Fort Benning’s National Infantry Museum, Springfield Armory, and Rock Island Armory. However, it is important to note that the history of firearms goes beyond war and, while not as common, other history museums do interpret the history of target-shooting and sporting cultures. These museums utilize interactive displays and diverse types of artifacts that connect to a larger story that is in tune to the missions of individual organizations. However, often, employees designing these exhibits have little to no background in firearms, which can cause problems when they are unaware of specific safety, security, legal, and interpretation standards. While contextual exhibitions are the most typical for history museums, encyclopedic collections are approached through different methodology. Some large collections like the Smithsonian Institution’s National Firearms Collection are mostly vaulted except for a few hundred firearms that integrally mesh with a particular storyline. However, other institutions have attempted to tackle these arduous collections through vast displays of firearms behind glass—the Gun-quarium. The Gun-quarium showcases firearms that are artistically arranged in a case with little, and in rare instances, no historical context—often to be observed but not necessarily understood by all. The only context is supplied through long text panels. In this respect, gun museums share commonality with art museums. Both have object-driven missions and tend to rely on large collector bases. These displays are referred to as arms and armor collections, extending beyond firearms to early historical weaponry and accoutrements. However, arms and armor exhibits function for the purpose of showcasing firearms for aesthetic and reverent observation. The diversion from art museums is that firearms museums apply this technique to the utilitarian as well as the embellished. Utilitarian pieces laid out in elaborate fans and artistic displays that cross firearms over one another make it difficult for a researcher to physically study an object rather than simply to appreciate it. While there are similarities between art and firearms museum display techniques, firearms museums are traditionally considered less academic, as they have been run predominantly by and for collectors. As expected this type of display is popular with collectors; however, if a visitor does not know much about firearms it’s nearly impossible to navigate through the complicated casework in order to draw greater conclusions on the roles of firearms in culture. An alternative for the deep researcher has arisen over the past decade. Gun-quariums may be aesthetically pleasing to the eye and a preferred method depending on audience and mission, but they are difficult for students of design or engineering to study. One way that museums in general are attempting to provide a deep research experience and a means to feasibly showcase large collections is through visible storage. Visible storage allows for an exponential number of firearms to be on display and also permits viewing from both sides. It has become a popular way for collectors and manufacturers to see the evolution of subtle variations in specific firearms models. The last method is usually combined with the Gun-quarium in museums that have firearms collections. As previously noted, museums with firearms collections do not always have the appropriate staffing. As a result, firearms are often vaulted or separated from the rest of the collection until someone can be trained on specific care and needs of these artifacts. When they are displayed away from the rest of the museum in a manner that limits interpretation, they do little for the visitor who seeks to understand the history and only reinforce the story for the collector who already knows it. So, with these five general styles of display in some form or another, how do we take these methodologies and push them into the twenty-first century? 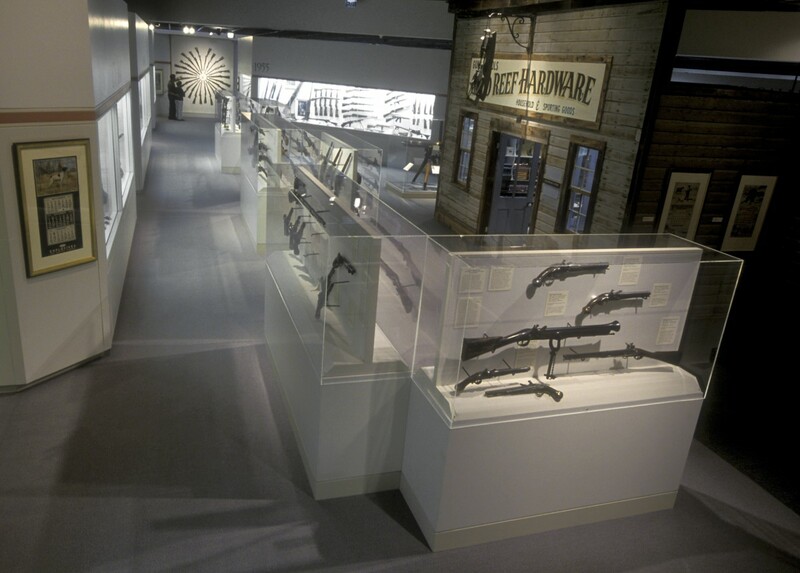 The Cody Firearms Museum is one of five museums at the Buffalo Bill Center of the West. It is an American Alliance of Museums-accredited institution that houses an international and encyclopedic collection of firearms and related objects. Collection items date back as far as the 1200s and as recent as 2017. The current configuration of the museum follows both Gun-quarium and Visible Storage methods. However, because it is part of a larger complex, about half of the audience is not familiar with firearms. The museum is currently undergoing its first full-scale renovation since the 1991 opening. The renovated museum will seek to enhance the experience for not only the enthusiast but also the audience unfamiliar with firearms by better contextualizing the history of firearms; good, bad, or indifferent. In order to attract a range of visitors, the two-floor museum will be divided between the overall history on the main level and a research level on the lower floor. The main floor seeks to engage with the visitor on multiple levels. The front of the museum is dedicated to a primer on firearms to welcome those who do not know basic terminology if they wish to learn more. While this is seemingly pedantic, the terminology can quickly feel overwhelming, causing visitors to disengage. In basic terms, this gallery will help make technical information that will appear later in the museum feel digestible. Additionally, the space will educate on firearms safety. Throughout each gallery, from an evolution of technology to firearms of westward expansion and conflict, the exhibitions will seek to provide a chronicle not only of usages but why the arms functioned in various ways and how they affected the human experience. The military history gallery is a representative example of the attempts being made to forward a conversation rather than continue to showcase guns without context. The section will interpret the entirety of American military history through objects and interactivity. In the center of the space will be an oral history tent, where visitors can read and hear about soldiers’ experiences on the battlefield throughout history. It also features a component that allows veterans to leave their own stories to contribute to the narrative. On the opposite side of the tent is a video about the costs of war from the financial to the human, including the enduring effects beyond the battlefield of Post-Traumatic Stress and increasing rates of veteran suicide. Each gallery examines the yin and yang of firearms history. Most gun museums typically have avoided collecting objects of cultural trauma, but in the twenty-first century, with an encyclopedic collection, not discussing and acknowledging this part of the history appears an obfuscation. Thathistory should be integrated when relevant in the museum but should also denote when it is not part of the story. Attempts to push forward the ways displays are actualized and interpreted rely on an overall understanding of visitor expectation. As we design the museum, we are constantly inquiring and observing both public perceptions and the ways in which firearms are used, talked about, and understood. And these conversations can vary greatly depending on individual and groups of artifacts. Historical Cut-Off Date for Controversy? The debate on firearms can impact how a visitor perceives a particular type of gun, which places the educator in the position of acknowledging visitor expectation while balancing the message and history that an exhibit is intended to convey. Oftentimes, there is a hierarchy for items that are considered controversial depending on current perceptions and events. In 2016, I curated the first exhibition of Glock firearms in the United States as a means to discuss the development of polymer technology in the late twentieth century. While the exhibit was predominantly technological in nature, the exhibition was met with fierce resistance by visitors and several board members. They felt the firearms museum had no place interpreting black firearms and should stick to what they perceived as “historic pieces.” However, most of the firearms in the exhibit were made in the 1980s, so they too had some historical lineage. While the Glock firearms only had thirty years of history, other firearms that are far older can carry the same baggage. Firearms on display that are not new technology but perceived as such are sometimes met with resistance. For example, semi-automatic and automatic firearms invented in the 1880s are still a technology used today. While they are well over 100 years old—some semi-automatics fall under the federal designation of an antique and are not technically a firearm—the fact that the technology is still used and debated in the present makes it difficult to discuss its historical past. Most firearms that pre-date the nineteenth century and the industrial period tend to be freer from controversy, although as conversations change even they can be subject to politicization. Firearms available from the period of the American Revolution recently have been the subject of political punditry for both pro-gun and gun-control advocates. Gun-control advocates use firearms prevalent during this period, single-shot rifles and muskets, as an example of the Founding Fathers’ intentions for the Second Amendment. Pro-gun advocates reference repeaters and artillery pieces designed and available at the time as the basis for modern technology. Both groups are accurate as to the types of firearms available ranging from common to rare, but also interpret these artifacts to further a point rather than to study them critically. Acknowledging and understanding the points of controversy can help facilitate deeper examination of objects and create more effective interpretive displays to demystify the politics around the objects. But how do we improve this ever-complicated, ever-changing area of study? Firearms can be interpreted in a variety of ways depending on the mission of the institution, the type of collection, and the current political climate. However, lack of material-culture study on the subject has led to a dearth of knowledge in the academic community—a hole that has been filled by collectors. Some collectors have done a tremendous job researching technical information while others have relied on colloquial knowledge, perpetuating mythology of firearms. Furthermore, there are even fewer people who are trained to connect the dots. The symposia series and association referenced in the beginning of the article should narrow this by training museum employees, encouraging original scholarship, and placing more firearms courses, with a material-culture focus into the university system. The attendees of these forums represent a range of personal political beliefs and attitudes toward firearms today, yet they come together in the hopes of better preserving and understanding this history in order to foster further and more productive discussions on firearms in the future. At the May 2018 Arsenals of History Symposium, we held the first meeting of the Association. I was elected as Founding President and my Assistant Curator as Secretary/Treasurer. We are in the process of finalizing paperwork and Bylaws to hold our first meeting of the Board of Directors in December. There is an international organization in existence that relates to firearms through militaria; its name is ICOMAM – International Committee of Museums and Collections of Arms and Military History. The term Gun-quariumwas coined by Professor Benjamin Nicholson, Art Institute of Chicago, at the first Arsenals of History Symposium. It was much cleverer than anything I could have come up with to describe this type of display. Pre-1898 Bureau of Alcohol, Tobacco, and Firearms definition for an antique. https://www.atf.gov/firearms/firearms-guides-importation-verification-firearms-ammunition-gun-control-act-definitions-0. Accessed 8/14/2018. Ben Nicholson, professor at the Art Institute of Chicago, already has established a firearms and design course that he teaches at both AIC and Cornell University, and some additional coursework already exists. It is also important to note that there may be more academic firearms options in certain European Universities. Ashley Hlebinsky is Robert W. Woodruff Curator at the Cody Firearms Museum at the Buffalo Bill Center of the West in Cody, Wyoming. I visited the Royal Armouries Museum in Leeds, and was very disappointed in their displays. The lighting was terrible and too dark to see the details in the pieces. It was as if the curators were ashamed to show off their collection. I’m pleased to hear you are taking the subject of firearms displays seriously.